Drive early morning towards the west from Kampala and have a stopover at the equator for photographs, Proceed to Bwindi via Maramagambo forest and Ishasha sector following the mystical Rwenzori Mountain range for much of the journey. As you drive along the road via Ishasha sector, animals such as the waterbucks, elephants, antelopes, buffalo, kobs, can be seen along the road. You will arive in Bwindi late evening. Dinner and over night at the luxurious Gorilla Resort Camp/Mahogany Springs (High-end),Lake Kitandara Camp (Mid range) /Basic Buhoma community bandas. You will have an early morning entry into the Uganda mountain gorilla sanctuary. The rainforest is spectacular as it offers a dramatic, heavily forested and dense landscape crisscrossed by numerous animal trails, allowing access for tourists. 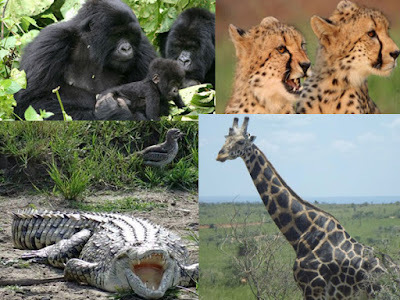 Recorded mammals here include the endangered mountain gorilla, the rare golden monkey, buffalo, elephants, black-fronted duikers, bushbucks, leopards, giant forest hogs as well as other animals. This park is best known for the fascinating gorillas trekking safari, where the time taken and terrain varies according to the movements of these marvelous primates. The thrill of spending time with and observing these gentle giant gorillas is a rare, moving, awesome and exciting adventure that will leave you with long lasting memories of a truly Uganda gorilla safari unique experience. The gorillas are shy and peaceful animals and it is an unforgettable experience to watch and photograph them as they interact with each other. Dinner and over night at the Camp. You will be early for briefing by the guide at Ruhengeri Park headquarters in Pac de volcanoes. The Rwanda gorilla trek begins at 9:00am and the time spent trekking depends on the movement of these wonderful giants. After the trek drive back to Uganda. Dinner and Overnight at Kabale White Horse inn. After early breakfasts, Head to Kampala and arrive early enough for your lunch, the drive back to Kampala stops at the Mpigi Royal Drum Makers. Here you will be able to watch the ceremonial drums being crafted using methods passed down through generations. There will also be time to stop at the equator for photographs and you will arrive in Kampala by mid day. Be transferred to the airport for your flight.